Sorry for missing my self inflicted oil spill blog deadline - the past few days were crazy for me and I never got to it. Speaking of which lets get to the matter at hand, the weekly oil spill update. This week 11 sea turtles were transported out of the Institute for Marine Mammal Studies, (IMMS) located in Mississippi, to free up space for oiled sea turtles. Nine of the turtles went to SeaWorld and two went to Disney. None of these animals were oiled however, each stranded with injuries related to interactions with humans. I believe several were hooked accidentally by local fishermen. IMMS will now have more space available to accept oiled sea turtles if it becomes necessary. 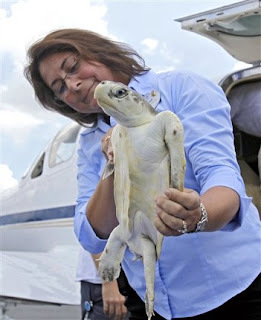 In the photo below, Jane Davis, curator for Disney's animal programs, checks over a Kemp's ridley sea turtle fresh off the transport plane. Disney is a long time partner of ours in the effort to save endangered sea turtles; two of their veterinarians are NEAq alum! 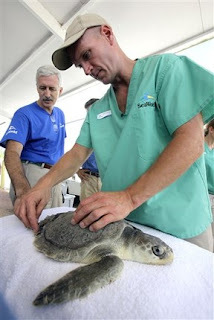 In the photos below SeaWorld veterinarian, Dr. Scott Gearhart, examines a Kemp's ridley sea turtle upon arrival to their facility. 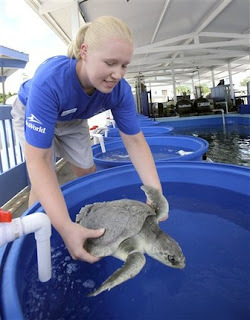 In the photo below on the left a SeaWorld staff member, Lateesha Hektner, lowers a sea turtle into its new rehabilitation pool. I borrowed the photo on the right from the SeaWorld blog to show their excellent triage facility. Sea World has a talented staff in veterinary medicine and in their ability to design and quickly set up emergency facilities for events such as this oil spill. 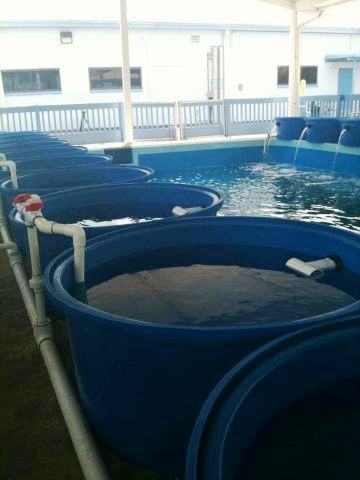 This triage center below is excellent in that the flow through water systems will provide excellent water quality for these animals. 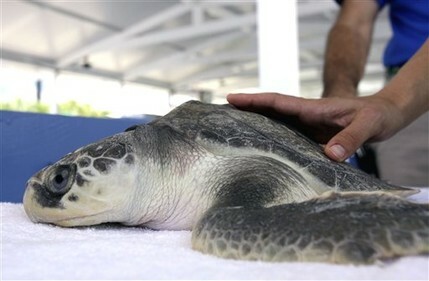 The other significant and current news regarding sea turtles is the announcement by the U.S. Fish and Wildlife Service and the NOAA Fisheries Service to relocate nests. They plan to dig up upwards of 70,000 sea turtle eggs along the nesting beaches in Alabama and Florida in hopes of salvaging this nesting season. In short, the fear is that the hatchlings will enter the Gulf and either consume contaminated food and die or perish in the oil itself. I'll summarize the situation for you, however you should really read about it yourself (see link below). I have read most every online story about this issue and have attached a link below for the best article. This article is the most significant since it quotes both Barbara Schroeder, biologist in charge of sea turtles for NOAA (read more about her here) and Sandy MacPherson, biologist in charge of sea turtles for the Fish and Wildlife Service. These two women have made it their life's work to study, promote and protect sea turtles. Their combined impact on sea turtles is immeasurable. It brings me great comfort to know that they are leading the charge to save as many sea turtle as possible throughout this oil spill disaster. Barbara Schroeder and Sandy MacPherson both know and acknowledge that the nest relocation plan will have its risks and that they expect some number of mortality. The relocation plan, directed by Sandy, outlines strict handling protocols and transport protocols. Relocating nests is not a new science and they will use every effort to reduce the number of deaths. Through the natural process of nesting, hatchlings emerging from the nest already experience a high mortality rate. Eggs are dug up and consumed by predators, nests flood and birds and other animals consume many of the hatchlings as they crawl down the beach. I can only speculate that the mortality in a controlled environment eliminating the factors above might be equal or less than the natural mortality rate... only time will tell. Either way they have to do something to salvage this nesting season. The devastation on the population if we loose this entire nesting season could prove disastrous for Kemp's ridleys and loggerheads in particular. Click here for access to the article I mentioned above. As always, use this link if you're looking for ways you can help during the disaster in the Gulf.